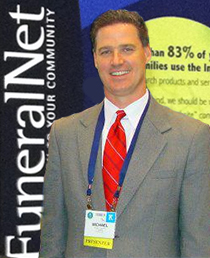 Research that helps funeral directors, cremationists, and cemeterians make informed decisions. With more than a decade and a half of service to the death care industry, FuneralNet has emerged as an industry leader in market research of online consumer behavior and preferences. We know in today’s online world, traditional marketing and the old tried-and-true communication methods with families are increasingly less effective. Our commitment to education led us to create a bureau of knowledgeable and experienced speakers, and to share our research findings with the death care industry. The Speakers Bureau has informative, research-based educational programs on different consumer connection technologies and strategies. These non-promotional presentations help funeral directors, cemeterians, and cremationists identify their best practices to help grow their businesses. Our speakers transform complicated online technology concepts into practical how-to action steps. The Speakers Bureau presents authoritative lectures and Webinars that help industry professionals thrive in today’s competitive landscape. Each of our speakers has experience working with hundreds of companies. Every speaker is deeply versed in deploying online tools specifically for practice growth and efficiency. For more information about FuneralNet Speakers Bureau, or to schedule a speaker at your next educational event, contact Brian Young at brian@funeralnet.com or 800-721-8166 ext. 536.